California HOV Lane Access Green Stickers - When Will They Run Out? Thanks to a number of readers who requested for an update on this blog, I am updating the graph below to represent the new green sticker limit of 70,000. The new numbers show that green stickers will reach their allotted limit around June 10th 2015. However! Note that I predicted that the previous limit of 55,000 stickers will be reached by Nov 14th 2015 ... in reality there was a significant up-tick close in on the limit (see graph below) and they reached 55,000 stickers on Sept 23rd 2014 ... a whole month and a half ahead of the predicted date. So learning from history, we can expect another up-tick right around beginning of April. So if you want to play it safe, get your vehicle in early April. The question on everyone's mind trying to buy a plug-in hybrid electric car (PHEV) in California seems to be ... will I get the coveted GREEN HOV lane access sticker before the quota runs out! A friend of mine was on the fence about buying a Plug-in Hybrid Prius and was not sure if he will get the Green sticker in time before they all run out. The California ARB website, publishes how many of the Green stickers have seen issued. Their last published number was 60,537 as of Feb 26th 2015. You can calculate how many are left from the current quota of 70,000 total green stickers. So 9,463 left as of Feb 26th 2015. The problem is they don't show us how many stickers they have been issuing in the past, so there is no sense of the trend or rate at which stickers are issued ... or when they will run out! I decided to use the Internet Archive and their handy Wayback Machine search function to look up previous versions of the same ARB webpage to make a trend for myself. See chart below. From the Internet Archive, I got three earlier versions of the ARB website that showed the number of green HOV stickers issued at three previous dates, and the current one makes the 4 data points on the graph. Plotting a straight line across these data points, I get a linear trendline. The slope of the line indicates that about 71 stickers are issued every day. So that's the rate at which green stickers are getting issued. This number also gives you the rate at which Californians are buying plug-in hybrid electric cars ... which I'm sure is a useful number for some policy advocate somewhere in Sacramento! 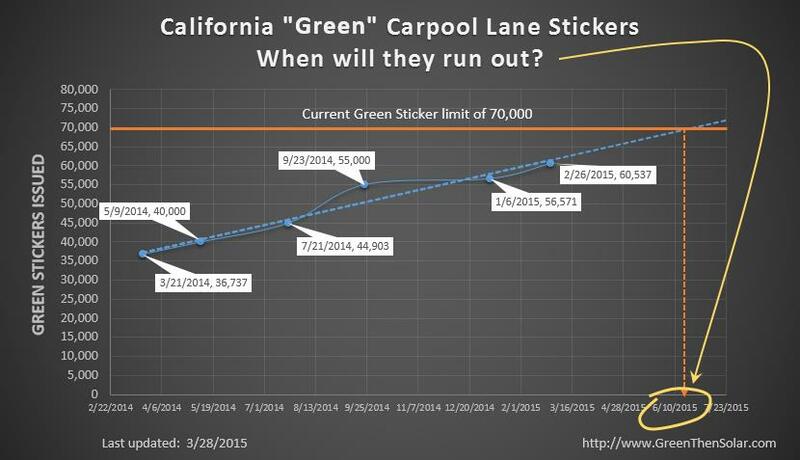 If the same trend continues, the current limit of 70,000 green stickers will run out on June 10th 2015. Now, we can potentially expect an up-tick on the graph as we get closer to finishing up the 70,000 sticker quota (as we see close the the earlier limit of 55,000 in Sept 2014), so in reality they may run out a faster than this straight line trend predicts, perhaps early April. Here's a nice video from the makers to Chevy Volt about the steps you need to get your Green HOV Lane sticker. WHITE stickers are for all electric / alternate fuel vehicles (like Tesla Model S, Nissan Leaf, Fiat 500e etc. ), and are unlimited. Both stickers are valid through January 1, 2019. The California ARB website is an excellent resource that lists all current car models that qualify for an HOV Lane sticker. Hope this helps your buying decision for a more efficient car! Please leave me a comment / share if this helped you.